Saturday July 24th 1909 I got my work done early and a nice dinner on the way and Mother Hattie Aunt Erma and Mary Briggs came out. We had such a good visit They all went home at 5 oclock buy Mary and me visited all evening I sent a letter to Lizzie Lindley today in answer to one gotten yesterday Sunday July 25th 1909 We were late getting up this morning I did up the work and Mary and I went to church We got our dinners at the ["Buckle?] We visited in afternoon. We hear from the home folks that Mrs Teeters died very suddenly today and Roxie [Chalfort?] telephoned me that Will was very sick. Monday July 26th 1909 Mary did some washing for herself and I the house-work We went to town in the afternoon I got some things for the house and had my things fitted at Mrs Conklins. 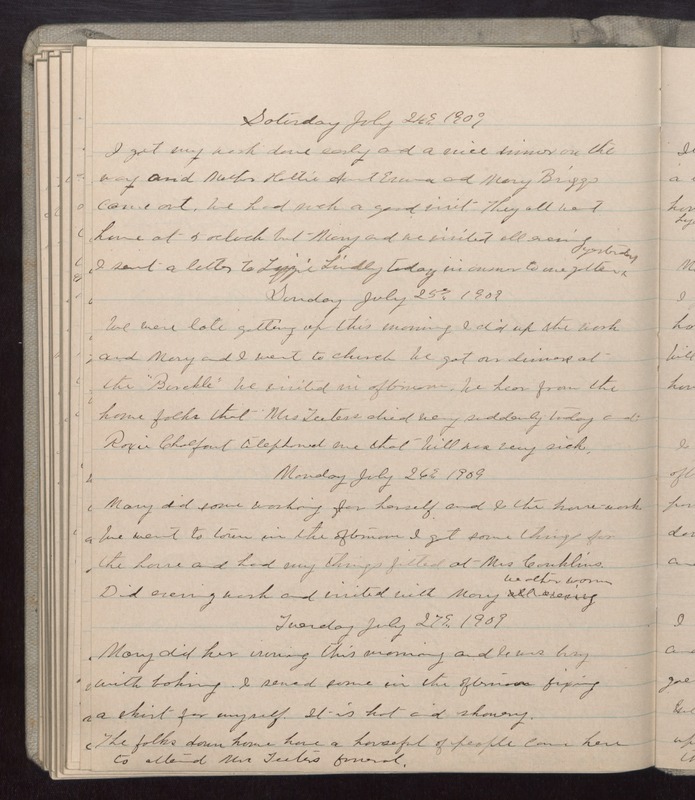 Did evening wash and visited with Mary weather warm Tuesday July 27th 1909 Mary did her ironing this morning and I was busy with baking. I sewed some in the afternoon fixing a skirt for myself. It is hot and showery. The folks down home have a houseful of people came here to attend Mrs Teeters funeral.